For many people, unhappy with their nose, the prospect of having surgery is dauntingly painful, expensive and high risk with numerous complications including black eyes, breathing difficulties and infection. Non-surgical rhinoplasty, also known as a non-surgical nose job, injectionrhinoplasty, or the “15-minute nose job”, can be a lower-risk, lower-cost alternative allowing patients to get straight back to their day to day life without any downtime compared to the surgical rhinoplasty or “nose-job”. For those who can’t afford the expense or downtime associated with surgery, or for those who are simply afraid to actually have surgery, it can be quite a relief to hear that there is a safer, effective option available. The non-surgical rhinoplasty involves reshaping, recontouring and modelling of the nasal framework without using surgery but by safely placing a dermal filler between the bone, the nose cartilage and the skin to correct unwanted deformities. The dermal filler used is hyaluronic acid; a substance that can be naturally found beneath our skin. For many patients, we have been able to relieve a life time of worry and dislike of their nose and having their photo taken. Our most caring Dr Alexandra Day will always invite you to join us in our relaxed spa to discuss all your concerns and really establish what you would like to achieve. Patients are always delighted to find the treatment is pain-free, only takes 15 minutes and allows them to have complete control of the design of their nose, and see the results immediately. Results are soft, natural and beautifully harmonised with all your facial features. 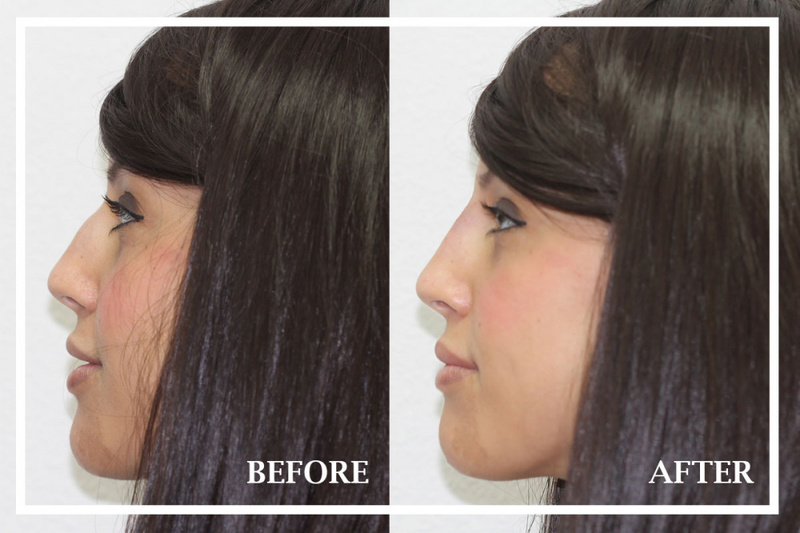 What can be achieved with a non-surgical rhinoplasty? What are the advantages of a non-surgical rhinoplasty? The changes that can be achieved by using dermal fillers are soft and natural-looking. The cost is a tenth of that of surgery. Much less expensive. Dermal fillers are injected painlessly under local anaesthetic so avoid the need for hospital admission and general anaesthetic. Results are visible immediately as compared to almost a year for surgical rhinoplasty. The patient is conscious during the procedure and can interact with Dr Day who always insists you feel in control of the procedure and the design of your nose. No downtime is required after the procedure and any minor bruising or redness could be covered by makeup. After you have had a relaxed consultation the procedure itself will only take around 15 minutes. Risks associated with surgery including, infection, severe bruising, bleeding, breathing difficulties significantly reduced. You should avoid touching or applying make up on the treated area for 6 hours in order to prevent infection. Specific post treatment instructions will be given during your visit. The results are immediate and last from 12-18 months over which time the filler will naturally be broken down by the bodies own enzymes. What is the dermal filler used? We use only safe and highly tested dermal fillers based on man made hyaluronic acid (HA). HA is naturally found throughout the body as well as in most other living organisms. It has many functions, including giving the skin elasticity, volume and providing us with a youthful appearance. The gels we use at Black Swan Dental spa consist of non-animal, cross-linked, hyaluronic acid (HA) and are made in a laboratory. They contain no human or animal DNA and have the best safety profile of all the fillers currently on the market as it is the only type of filler that is reversible. There is very little to no down-time involved in the procedure. Most patients return to their normal, daily activities right after their visit. There is no significant swelling, bruising or pain. We advise sunglasses or heavy eyeglasses must be avoided for two weeks after the procedure. If you have a major event such as a wedding or photo shoot, we recommend you leave minimum 2 weeks before the event to have your treatment. Non-surgical rhinoplasty is 1/10th of the cost of surgical procedures and start from £250 including your consultation and follow up review appointments. Contact us on 0146077517 to book your comprehensive consultation with Dr Alexandra Day in our beautiful, relaxed, spa environment. If you’d prefer to email you can contact us at office@blackswandentalspa.co.uk. We are always happy to happy if you have any questions or queries.